When you attend the Post meeting, record these activities on the sheet provided at the Guard’s desk. Be sure to include the number of hours in which you were engaged in the activity, mileage incurred, and any out-of-pocket expenses. A few examples of community service activities that qualify are listed below. If you are in doubt as to whether an activity qualifies, go ahead and report it. We will sort it out . If you cannot attend, list activities in which you were involved and send this information via email to Post Surgeon Charlie Gaull. This information is submitted to the VFW Department of Washington and is needed to justify the non-profit status we have been granted. We want to be able to recognize the contributions to the community of all of our comrades. 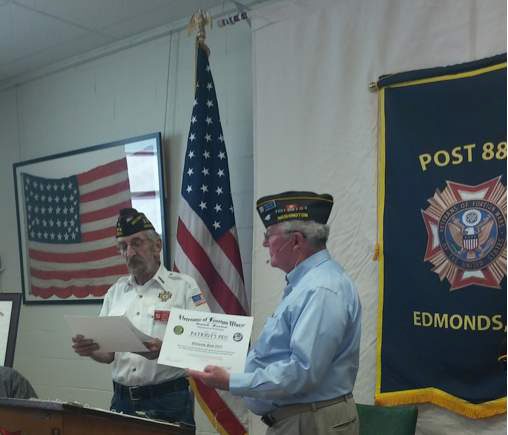 District 1 Commander Don Wischman visited our July meeting to present the post with award certificates for accomplishments during the 2016-17year. Sponsorship and Promotion of local community activities.